Flynax Pet Classifieds Software is intended for launching an online pet shop, animal shelter or a platform for pets-related service providers. Using flexible CMS you can monetize your site using different payment options or offer free services. The script is optimized for sharing pets in social networks, and comes with fully responsive themes, plugins, all necessary categories and fields. With this option a user can easily post a quick ad without going through registration just by entering all details, his name and email. Using a flexible search form manager you can create a compact tabbed search form with fields specific to a particular section. Apart from adding new sections and animal types you can manage breeder and pet fields, search and submit forms, categories, boxes etc. 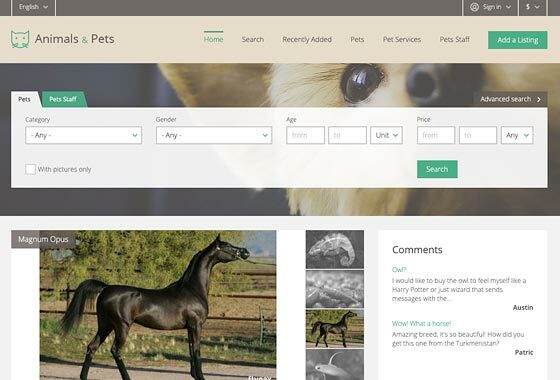 Whether you want to add a carousel with found or featured pets you can always do it with listing boxes and place them on any page. By purchasing featured packages breeders and private owners will be able to show their pets in a catchy gallery on home page. You can charge users for adding listings, featured pets etc using more than a dozen of payment gateways and options. You can always boost your site with powerful plugins related specifically to pet classifieds software. Displays recently added, popular and featured listings in boxes. An alternative way to charge users for extra services provided. 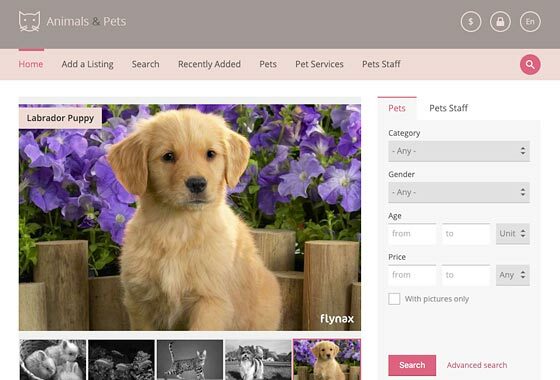 Users can filter pet classifieds on listing types and search results. Offers Back and Next links for quick navigation between ads. Exports the main photo and listing details to a PDF file. Buyers love reading comments about items they are interested in. Allows users to rate ads and shows an average rating in grid.